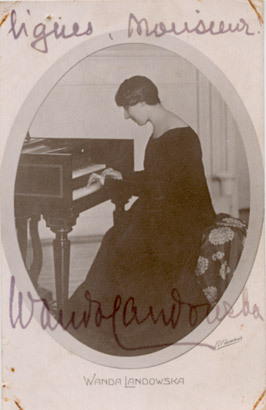 One view of Landowska’s musical impact comes from Denise Restout, who worked with the harpsichordist for some twenty-six years. To hear the Goldberg Variations played for the first time this century on the harpsichord, one of Landowska’s great achievements, was an astonishing experience in which Restout found herself “stunned more than anything else. It was like being in front of one of the greatest works of nature.” Restout became her assistant, and now, an octogenarian, possesses a lucid ability to recall her mentor’s life and art. While Restout supervised and edited one volume of Landowska’s writings, there is a great deal awaiting publication. This is an urgent matter as she is compelled to teach daily to maintain herself, unable to devote all her efforts to produce a biography of Landowska and edit her unpublished writings and correspondence. In a lengthy interview with Restout in Landowska’s house in Lakeville, Connecticut, we learn of events in Landowska’s life which clarify how her art came into being. “So she went to Michalowski who was much more strict with her but understood who she was and let her play Bach. These men did not know the real interpretation of Bach. It was the time when the Bach tradition was gone. She studied Chopin with him and was a wonderful Chopin player herself and people would have given anything to have her record or play Chopin more often. There was a conflict in this way as she was brought up in the late Romantic tradition and wanting to do something else- to go back to the old masters. But what happened to her was that first of all, when she was about sixteen she developed a small growth in the hand. What was she going to do? She had a lovely voice and even thought of becoming a singer. But her mother sent her to Berlin to study composition and she studied with Urban, who had been the teacher of Paderewski. While she studied composition in Berlin and her hand was finally better and she could play again, she met a young Polish man who became her husband- Henry Lew. He was not exactly a musician but was interested in Polish folklore, mostly a writer. And he understood that she would not develop in the way she wanted to go if she stayed in Berlin. He knew that in Paris she would have many more chances. So they went to Paris and married, and there she was introduced to the Schola Cantorum, where there was Vincent D’Indy and all the great musicologists of the day, Pirro, and Albert Schweitzer, who came from Alsace very often to play organ at their concerts. So she was soon drawn into that circle in Paris where all the research was done into the work of Bach but not the harpsichord works, mostly the Cantatas, the Passions and orchestral works. She was introduced to French music, to Couperin and Rameau. “It was there that I met Wanda Landowska, who was playing the harpsichord in Falla’s Retablo . It was the first time that the harpsichord had entered a modern orchestra. I was fascinated by the work and by Wanda. ‘Write a concerto for me’ she said. I promised her to try. My encounter with Landowska was a capital event in my career. I have for her as much artistic respect as human tenderness. I am proud of her friendship, and I shall never be able to say how much I owe her. “At a quarter past three appeared Wanda Landowska and Alfred Cortot on the platform. A great ovation greeted the celebrated artists. Before the beginning of the musical part, Mme. Landowska addressed a short speech to the audience. She expressed her happiness in having realized the dream of her life and her thanks to her friends who helped her in this task. She said that this day was the happiest in her life. “Wanda Landowska’s playing of the harpsichord at Town Hall last night reminded one all over again that there is nothing in the world like it. There does not exist in the world today, nor has there existed in my lifetime, another soloist of this or of any instrument whose work is so dependable, so authoritative and so thoroughly satisfactory. From all the points of view- historical knowledge, style, taste, understanding and spontaneous musicality- her renderings of harpsichord repertoire are, for our epoch, definitive. Criticism is unavailing against them, has been so, indeed, for thirty years. “Her piano playing is another story. She likes to play Mozart in evocation of the way Mozart himself must have, or might have, played on the early fortepiano. To this end she employs, as Mozart certainly employed, a high- fingered technique similar to that which gives the best result in harpsichord playing. She never plays louder than forte , not because she wishes to keep Mozart’s music small but because she wishes to keep it musical. The modern pianoforte gives another kind of sound, in many cases an ugly one, when played with arm weight. In any case, the extension of piano writing into the domain of modern power pianism, an extension that began only with Beethoven, seems inappropriate to her, as it does to many modern musicians. “And so, limiting her dynamic range to approximately what was available to Mozart on the Stein fortepiano, she plays his solo sonatas for the musical contrasts that they unquestionably possess rather than for those for which they were never planned. As to rhythm, tempo, phrasing and ornamentation- all the rendering of their basic musical content- her performance is matchless. She makes them large and alive and vivid, just as she does the harpsichord works of Couperin and Scarlatti and Rameau and Bach. Her conceptions and interpretations are a lesson to any musician. Pianistically, all the same, her execution is a little unsatisfactory. “It is not unsatisfactory because of any technical inefficiency. It is unsatisfactory because the modern pianoforte, a less brilliant instrument than Mozart’s, does not yield what brilliance it has save by the exploitation of its full dynamic range. And Mozart’s piano music, as we know, was of brilliance and virtuosity all compact. It need not glitter, but it has to shine. Landowska gives us a photograph of it on the modern piano, very much as other pianists give us a photograph of Bach’s harpsichord music. “Our instrument is closer to Mozart’s than it is to the plucked instruments. But it is not the same instrument. That is why Mozart’s symphonies and operas and chamber music always sound more vivid to us in execution than his piano music does. Fiddles, wind instruments and voices do not have to walk through Mozart on tiptoes. The pianoforte, no matter how elegant its phrasing, inevitably sounds clumsy and a little meticulous. “The first movement . . . is a type of alla marcia which advances in canonic imitations. Tranquil at first, it augments little by little and develops into the same kind of triplet motive which marks the opening of the Jupiter Symphony. Thus this concerto, which has been neglected and ignored for so long, contains from its first notes elements of grandeur and dramatic power. “The Concerto. . . belongs to the period of Mozart’s great virtuosity, which extended from August 1784 to January 1786. Mozart had become the fashionable musician of the day in Vienna; he was feted by the Emperor, the aristocracy, and even by his own colleagues. During this period he composed a great number of works which were performed in public and at private academies. Mozart played the E Flat Major Concerto in Vienna on December 16, 1785. “The Allegro, with its symphonic features, is powerful, joyous, and solidly built, with broad themes against which garlands and light arabesques tenderly nestle. Between this movement and the happy spirited Finale, the admirable Andante- a sorrowful and touching lament- gravely stands out. Ornamented throughout with infinite care by the master himself, this Andante is perhaps one of the most beautiful in all of Mozart’s works. The sweet serenity of a little interlude by woodwind instruments interrupts this pathetic and poignant lament so divinely simple. Mozart had to repeat this movement after the first performance of the concerto. “In the Finale, a marvel of grace and sprightliness, Mozart seems to have forgotten his despair and his tears. From the very first note it bounces with that waggish gaiety that is Mozart’s alone. The effervescence of a Neapolitan dance mingles with the sentimental tenderness of a Viennese landler . The strings set upon a mischievous chase; the whole piece rings out in exuberant joy. The bassoon suddenly takes on an unsuspected agility; it whirls about, curtsies, and touches us by its efforts at being light-footed. Over a pedal-point the flute sings away madly with the tender abandonment of a prima donna, with trills, mordents, and appoggiaturas in the purest Italian tradition.